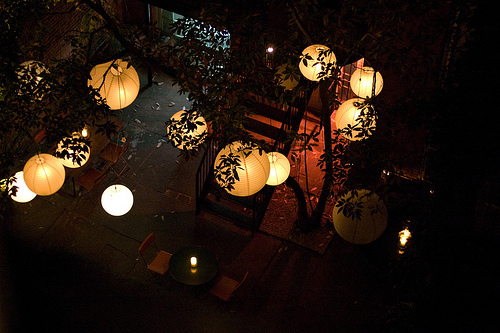 The type of patio lights you choose tells other people about your taste and your personality. At the very least, it should. Look around your patio and if you don’t feel like your lighting choices really reflect who you are and what you enjoy, it’s probably time to shop for some new ones. You don’t even have to change out permanent light fixtures if you’d prefer not to go to that expense, but just add a few things that really reflect your style. You can purchase lanterns that hang or stand independently. The style of lantern, whether something that looks antique in wrought iron or one that looks like a tiny cottage or birdhouse, will reflect your personal taste. Consider recycling and adding new life to an old fixture with the careful use of low-voltage wiring. As an example, you could take an old antique brass lantern and outfit it with a small bulb and wires instead of a traditional candle. You can choose lanterns that use low voltage lighting, solar lighting, or you can choose a candle lantern, with each giving a slightly different atmosphere. Perhaps you prefer cozy looking shapes like cottage-shaped lanterns or candles, lights that say you like the warmth of home and that you might be a bit old-fashioned. You know that candles never let you down and you might even like the look of something handcrafted or homemade like candles used to be. If you like the look of something handmade that’s going to last, a lantern made from wrought iron or with the look of that type of iron, will tell other people that you like a solid foundation and something loyal and reliable. If you go for whimsical and quirky lights like a string of flowers or butterflies, you’re showing off your sense of fun and letting people know that you’re easy-going and probably easy to be around. Are these true psychological profiles based on your outdoor patio lights? No, of course not. However, the style you choose, whether outdoors or inside your home, can tell people a little bit about your personality. That’s why you should choose things that truly appeal to you instead of what happens to be the trend or fad at the time. Not only will you be showing off your sense of style, you’ll be creating a space that’s the most comfortable and pleasant for you to be in. PreviousIs a Corner Shower Right for You?